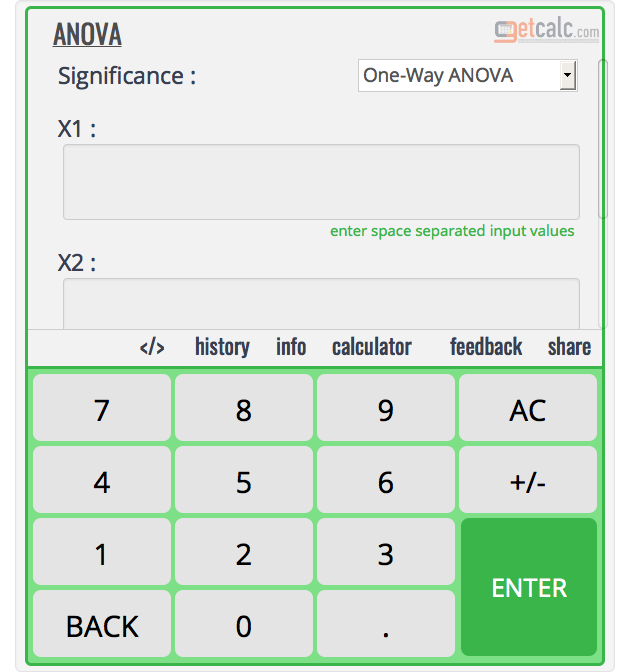 The below is the example work with steps shows how to generate the two way ANOVA table for the different means of treatments (rows) & subjects (columns) to find the F test statistic for test hypothesis (H0) at a 5% or 0.05 significance level for three sample means x1, x2 & x3. step 8 The above sum of squares together with their respective degrees of freedom and mean sum of squares will be summarized in the following table. [(k –1), (k – 1) (h – 1)] degrees of freedom at 5% level of significance. The critical value variance between varieties is obtained from F table for [(h – 1), (k –1) (h – 1)] degrees of freedom at 5% level of significance. There is no significance difference between treatments, since the calculated value of F0 = 1.0354 is smaller than the table value of Fe = 5.1433. Therefore the null hypothesis H0 is accepted. There is no significance difference between varieties or subjects, since the calculated value of F0 = 0.6018 is smaller than the table value of Fe = 4.7571. Therefore the null hypothesis H0 is accepted.